NairaBet is among the online sports betting platforms that gives its services within the jurisdiction of Nigeria but is African facing. The company is under regulation from the Lagos State Lotteries board, which makes it trustworthy and reliable enough for its clients. Most of the users happen to be Nigerian while the name of the site originates from the currency of Nigeria. This, however, is not surprising when you consider that the company is based in the country. Because they have dozens of outlets throughout Nigeria as well as maintaining a significant presence outside, Nairabet mobile hopes to stand as one of the significant betting platforms in Africa. It also happens to be among the most professional betting companies on the continent. This is due to the fact that they have a team of professionals that are highly trained to handle all customer needs. This allows you to open an account and place your bets over the phone as you go, and a whole team of operators will work around the clock to make the process smoother. As for the player, the minimum amount you can use to bet is 2,000 Naira when you are placing bets over the phone. Although the bookmaker can allow some flexibility and the operators can accept lower amounts (at their discretion). The mobile site is also one of the most comfortable and user friendly as well. Thanks to the advantageous promotions and very good payout structure, it gives all its users the motivation to place their bets. Another feature that has led to its immense growth is its acceptance of Nigerian Naira alone. It contains features that develop the experience of the participants and increase their chances of winning, such as virtual bets and online casinos. The platform is a member of the NBA (Nigerian Bookmarker’s Association), and is the leader of all betting companies within the country. This could be thanks to its unmatched bonuses, fastest and highest payouts, the easy recharging process of accounts, and the high odds. 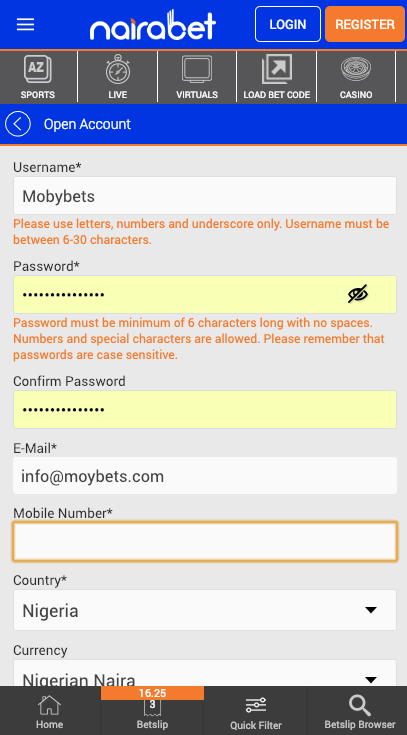 Keep in mind that you can place bets on both the mobile app and the official website. Regarding the Nairabet mobile platform, both the Nairabet old mobile and Nairabet new mobile give you a chance to access your account and place bets – as long as you have an internet connection. You can even access the platform through the browser on your smartphone. The Nairabet new mobile platform was primarily intended for servicing a greater number of their clients. Also by serving them at faster rates than the Nairabet old mobile platform. An additional reason was developing an interface that had higher levels of user-friendliness. If you have an account on the old platform though, you do not need to worry about any of your details getting lost when you make the switch, and the company gives you a bonus of 1,000 Naira. It is very easy to register, as it is free and you get a deposit bonus of 100 percent. When you want to create an account, you first enter your personal information. This includes your email address (this will give you access to the letter that contains your registration information), your last and first name, the date of birth (to ensure you are over 18 years old), and your cell number. You will also need to create a password and a username. Why create an account with Nairabet new mobile? There are a number of advantages you get when you open an account, aside from the bonus you can use to place bets on. One of them is the ability to place a real-time betting variant, also known as live betting. That means you place bets and change your odds as you monitor a game in real time. If you are using your phone, you have a chance to place bets on soccer matches, and you can do it in a better way than on the Nairabet old mobile platform. On the new mobile platform, you also get a new registration parameter, which was not available on the old mobile platform. The platform has the ability to adapt to the screen [format of any device it is using, so you are able to view the content in a way that is comfortable to you. Like with most other betting sites, the most common sport offered is football. The interest in local championships is part of the reason there is such a wide variety of football tournaments offered, as well as betting on games happening in nearby countries. In fact, the introduction of the Margin Maker 2 system allows you to bet on games in real time at a faster rate. Other sports you can bet on include badminton, Aussie rules football, basketball, the Rugby League, table tennis, and tennis. Among all the betting platforms in Nigeria, Nairabet is the only one to offer this feature. If you have ever been unsure of the selection you are supposed to make from a whole list of so many games, you are probably familiar with the frustration of the moment. The task of combing through all the available games to find the one you need to bet on becomes a hectic and time-consuming mission, making your day less profitable and exhausting. Even though you may be an experienced user. This feature steps in to save the day, because it allows you to schedule games comfortably and makes the most out of your bets. 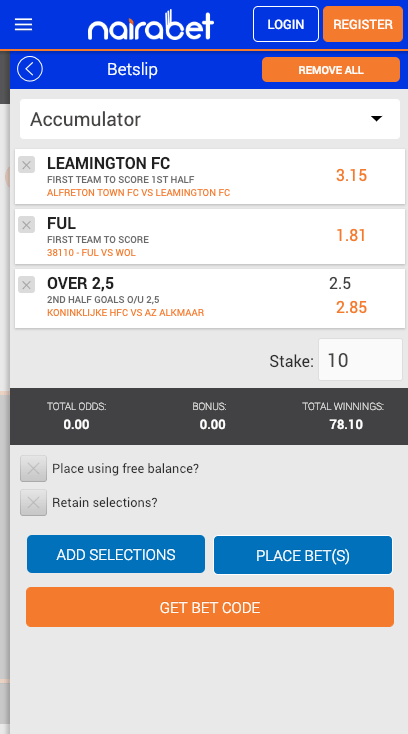 It is among the new features on the Nairabet mobile platform. This helps the bettors to make faster selections on games and reduce their margin of error. You can access the feature on the homepage, and it has two fields that you must filter. The first is the ‘Amount to win’, where you enter the amount you want to win at the end of the process. The second criteria are ‘Stake’, where you enter the amount you are placing as a bet. After this, you will need to fill in the odds range that you want and then select ‘Go!’ at the bottom. The platform will then generate a bet slip, which contains all the games placed at the odds you wanted. 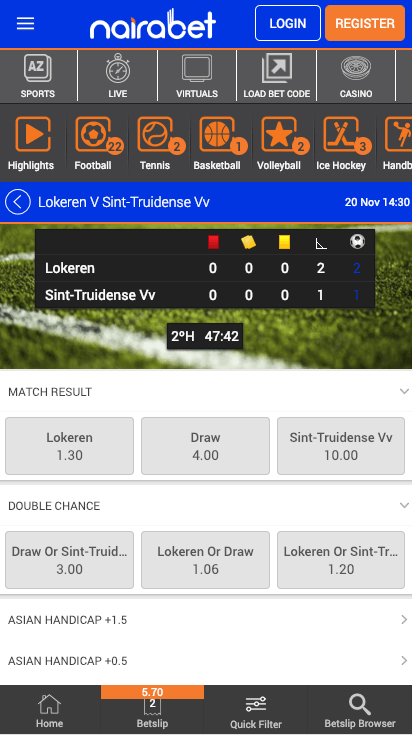 Both the desktop and mobile versions of this app are among the most user-friendly and pleasing mobile betting websites you can find. The navigation is very easy. 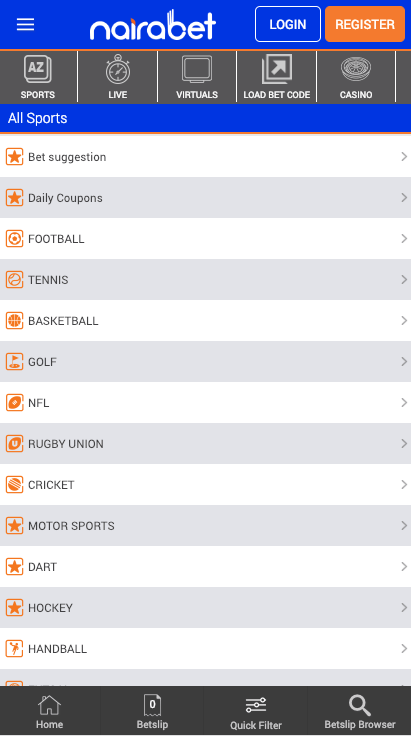 On the left, you will find the all-sports markets; on the top of the screen, you find popular pages – including daily coupons, in-play, and promotions. The right side of the page contains a bet slip, which updates every time you make a selection. Therefore this is allowing you to see your potential wins and wagering options. These days, mobile betting is just as prominent as the traditional betting methods, and Nairabet mobile has not been left behind in this – even incorporating the Nairabet mobile lite that occupies less space yet gives you the most important functions. All you need is a smartphone, an account on the platform, a stable internet connection, and the means to transact your funds. As per Nigerian gambling laws, you can only participate if you are 18 years and above. An advantage that Nairabet mobile has is the inter-operability. That means that you can operate your account regardless of the device type you have. Whether it is a Nokia, Samsung, Huawei, or even tablets. It even works very well on all computer operating systems, making it highly favored within Nigeria. Even though the number of sports markets on the Nairabet mobile and desktop offer have increased over time, the betting coverage is still not as wide as some of the competitors. The football fans are not going to have short supplies of what they love. The options include first goal scorer, even number of corners, total goals, match-winner, and so on. However, for other sports, you may have to dig deep to find something worth noting, and many sports only have a handful of markets. The one factor that makes Nairabet stand out is the high quality of live betting capabilities. Live betting featuring a wide variety of markets available every day. The odds it offers are very appealing, and this is a feature that is increasingly becoming popular. In addition, you can also get virtual betting markets, which are also increasing in popularity. Regarding the option of live streaming, this is only available for horse racing. Many other bookmakers will provide their customers with the chance to watch many game types from all around the world, and Nairabet can seek to improve this service. The good news is that streams are always high quality and fast, so the game fans can watch the unfolding as they occur. The other good thing is that you are not required to place bets or deposit cash so that you gain access, so even if you do not have an account, you are still able to continue. Nairabet goalless draw money back – this is when you place a pre-match bet on any EPL game or 1x2 and the match ends in a goalless draw. You get 100% refund of your original bet. One game cut your ticket promotional bonus – if you have a multi-ticket and it is ruined because of one result, you will get 10% of your estimated wins up to a maximum of 100,000 Naira (this excludes the game that ruined your results, as well as any bonuses). 100% bonus on accumulator bet – the platform increases your bonuses the more games you add to your bet slip. Double your odds on Lucky 15, 63 and 31 – when you only win one line of your bets, the platform automatically doubles the odds of that win so that you win more money. Note though that it will eliminate your stake on that line. The platform ensures that it caters to the needs of all its customers, through partnering with a variety of methods. This can make it easy for you to deposit and withdraw cash. You can use major credit and debit cards, pre-paid cards, and e-wallets (especially the most popular ones). Deposit methods include GTBank, Naira MasterCard, Visa, Bank deposits, ATM and Verve. The processing of withdrawals is free of charge, although you could note that you can only withdraw 500,000 Naira at once.